This week’s theme, tabletop RPG adaptations, let’s me share Simon Stålenhag’s artbook, Richard A. Knaak’s newest fantasy series, and the famous judge created by John Wagner and Carlos Ezquerra (who just passed away). All of these projects are live on Kickstarter. If you want to play as a teenager in the technopast 1990s using the Mutant: Year Zero system, or as a fantasy minotaur using either the D&D 5th edition or Pathfinder 1e rules, or as the law using What’s OLD is NEW (WOIN) game system, there are games waiting for you. Judge Dredd & The Worlds of 2000 AD Roleplaying Game by EN Publishing – UPDATE: Adding a link to the free quickstart here. Ends on Tue, October 9 2018 3:00 PM EDT. “Return to Simon Stålenhag’s world of the Loop in this new RPG. It’s the ’90s now, and things are different. This time, you can die. It started on Christmas Day in 1994. Dark water suddenly rose from the land, invading our homes and lives. They say it came from the depths inside the Loop. Whatever it was the Flood changed everything. Nothing would ever be the same again. Welcome back to the Loop. Things are different now. In 2017, we released Tales from the Loop the tabletop roleplaying game based on Stålenhag’s first art book. That game was an instant hit, selling out its two initial print runs and winning no less than five ENnies (including Best Game and Product of the Year) as well as three Golden Geek Awards (including Best RPG). Now, it’s time to return to the Loop and continue the story. In Things from the Flood you play Teens in the 1990s – a decade of change and disaster. You’re still balancing day to day life with solving exciting mysteries with your friends. But this is a darker time, and the stakes are higher. We are the Free League, creators and publishers of roleplaying games such as Mutant: Year Zero, Coriolis – The Third Horizon, Tales from the Loop and Forbidden Lands. As well as the original publishers of Simon Stålenhag’s art books. The lead writer of this book is the seasoned Swedish game writer Nils Hintze, backed up by the entire Free League team who handle project management, editing, and graphic design. The vast majority of the art in the game is done by Simon Stålenhag himself. Most of the art will be drawn from the pages of the Things from the Flood artbook – many scenarios in the game are based directly on illustrations in the artbook – but the RPG will contain some new original art as well, including the cover image. The book will have approximately 200 pages, in the US Letter format. Tales from the Loop Backer? If you backed the original Tales from the Loop RPG back in late 2016, you will get a PDF of the Things from the Flood core book, including the digital stretch goals in this Kickstarter, at no extra cost. You can still join this Kickstarter to get the printed book. The world does not seem so innocent anymore. Its the ‘90s and the once mighty Loop has been shut down, the experiment abandonded and the land bought by Krafta, a powerful corporation. You are no Kids anymore, but Teens trying to find your way in a decade of change – both within and around you. The Flood has transformed the once pastoral islands into a dark marshland. Some say that the dark water pouring out of the ground comes from within the Loop itself. Machines are afflicted by a strange virus turning them unreliable and dangerous. Still, your lives go on as before. You go to school, fall miserably in love, try to do everything possible to fend off boredom. When you hear about other teens going missing, and even turning up dead, you realize its time to gather the group again. One way or another you fill find out what these Things from the Flood really are. You play Teens growing up in the 1990s, trying to balance everyday life while at the same time solving dark mysteries together with your friends. The core of the game is the same as in Tales from the Loop, but the themes are different. Gone are the childlike tales of wonder and discovery, in their place are dark threats to the Teens and their world. Everything is changing, everything is falling apart. Figuring out how to deal with this is a big part of the game. You are no kid anymore, the world is both more exciting and more dangerous. Teenagers can get hurt – and even die. The stakes are higher than ever. Both! Things from the Flood expands the scope of Tales from the Loop to the 1990s. You can continue your campaign with the Kids from the original game or create brand new player characters. We call it a “standalone expansion” because everything that is needed to play the game is included in the book. That’s right, no previous experience is needed at all, just get the book and start playing right away. If you’ve read and played the Tales from the Loop RPG, you will find yourself right at home, this book expands the setting and introduces new exciting mysteries and threats to explore. The game engine of Things from the Flood is the same as the one for Tales from the LoopRPG and is based on our previous game Mutant: Year Zero, that was awarded with a Silver ENnie for Best Rules at Gencon 2015. The core mechanic is the same: To make a skill roll, you simply grab a number of dice for your attribute score, skill level and gear, and roll them all together. You need at least one six to succeed, and extra sixes can give you stunts and other bonus effects. The acclaimed artist, concept designer and author of the art books Tales from the Loop (2015), Things from the Flood (2016) and The Electric State (2017). Simon Stålenhag is best known for his highly imaginative images and stories portraying illusive sci-fi phenomena in mundane, hyper-realistic Scandinavian landscapes (expanded into America in his latest book The Electric State). Tales from the Loop was ranked by The Guardian as one of the “10 Best Dystopias,” in the company of works such as Franz Kafka’s The Trial and Andrew Niccol’s Gattaca. Not only have Stålenhag’s unique and cinematic images earned him a worldwide fan base, but have also made him a go-to storyteller, concept artist and illustrator for both the film and computer gaming industry. This year it was announced that The Electric State will be turned into a major motion picture and Amazon Prime ordered a full season of a TV show based on Tales from the Loop. During his twelve years as a game writer, Nils Hintze has written a great number of scenarios, articles and reviews, as well as being the main author of critically praised and award winning Tales from the Loop roleplaying game. Previously he has written plays for theatre groups. Nils is known for his ability to create scenarios which allow the players to explore their characters and their relationships while facing dangers and solving mysteries. The conflicts in his games are often built on personal dilemmas, where thrill and mystery is not seldom mixed with humor. Nils is educated in creative writing, but he normally works as a psychologist. Nils is also one of the three creators of the Swedish role-playing podcast Podcon. Free League Publishing is the international name of Swedish game and book publisher Fria Ligan AB. Since 2011 we have produced a range of pen and paper RPG’s, and have won several awards in the process. Our first international game, Mutant: Year Zero, co-published with Modiphius Entertainment, was awarded a Silver ENnie for Best Rules at Gencon 2015. Last year Tales from the Loopwon five Gold ENnies (including Best Game and Product of the Year) as well as three Golden Geek awards. We have also created and published Coriolis – The Third Horizon (2017) and Forbidden Lands (2018). Tales from the Loop won five 2017 ENnie Awards (Best Game, Best Setting, Best Writing, Best Internal Art and Product of the Year) plus several Golden Geek Awards (Game of the Year, Runner-up Best Artwork & Presentation). Fellow Guilder, John McGuire, did two articles on Tales from the Loop, the prequel to Things from the Flood. The first is his thoughts about the game from playing it at Gen Con, the second is a traditional review. It can be said that “roleplaying in the ’80s that never was” is a winner. The sequel pushes the clock forward from being kids in the 80s to being “teens in the 1990s – a decade of change and disaster.” The world is darker, the stakes are higher, the first bits of the internet are forming, and you are old enough to drive in a world that is turning into a dark horror. This standalone expansion (you don’t need TftL to play this) is waiting for you here. Ends on Sun, October 21 2018 10:02 PM EDT. “The first adventure in a trilogy based on NY Times Bestselling author Richard A. Knaak’s: Rex Draconis fantasy setting. Set in the world of Tiberos, the Rex Draconis RPG setting allows you to experience the epic fantasy of Richard A Knaak’s new world, dubbed by many as ‘the spiritual successor to Dragonlance’. Against the backdrop of war, play as honourable Minotaur, chivalrous knights, mischievous Kwillum or powerful wizards, as you thwart the warmongering of the savage Wheyr and the machinations of the mysterious draconic Fafni and Afafni. The Rex Draconis RPG is written for the D&D 5th edition and Pathfinder rules sets, and feature setting material that can be easily imported to any RPG system of your choice. The Rex Draconis RPG is being produced in conjunction with an active novel line. While the novels are not required to use and enjoy the RPG, this structure allows you to interact with and fight alongside your favourite characters in a living, growing setting that evolves as Richard envisions. It is also important to note that the RPG storyline is a separate and unique story, that interestingly crosses paths with the novel line. Rex Draconis is the latest offering from Richard A Knaak, renowned fantasy author, and creator of some of the most iconic elements of the Dragonlance world. Richard is credited with the strong development of the Minotaur culture and the Solamnic Knights, as well as many other elements that made Dragonlance such a unique setting. After many years, Richard has chosen to breathe new life into these embers, in an all-new high fantasy setting that combines favourite elements with an exciting new world, characters, monsters and storylines. The first novella – Under the Dragon Moon (Hydra Publications) – has been released, and the second – Lords of the Dragon Moon – is due for release shortly. Work has already begun on the next installment. With the success of the new novels, Richard would like to see the setting become a playable world for Table Top Roleplaying, much like its predecessor, the Dragonlance setting. Rex Draconis is wholely Richard’s creation, over which he has, and would like to retain, full creative control. Bringing on Phil and Micah adds significant indie RPG experience, with numerous successful products and projects and a proven track record. However without the funding of a large game company, alternative funding needs to be sourced for professional art, editing and layout, as well as production of both PDF & physical products. Considerable time, effort and expense has already been invested in the project, but to do it justice and create a standard we – and you – are satisfied with, further funding is required. The Rex Draconis Player’s Guide – This book is primarily an adaptation guide, offering rules changes to the chosen official rulesets to ensure compatability with Tiberos – the world of Rex Draconis. This book will include new races, classes, archetypes, rules and more, as well as advice on adapting the material from your favourite RPG systems to create a more personalised Rex Draconis experience for your tastes. Rising Tides – Adventure 1 – The first adventure in a series, Rising Tides allows players to foreshadow the action of the novels, playing roles that interact with the story in meaningful and lasting ways. In Tiberos, there is more than one story being told in this war. Rising Tides acts as a prequel to the official novel storyline and takes thre characters on a journey of discovery across this fantastic new world. Amble’s Guide to Avondale – This book is the first of the setting content, a complete guide to Avondale, the capital city of Dracoma, home of the Knights of Dracoma. This guide provides all you need to launch your own adventures in Tiberos. Digital Art & Map Pack – All art and maps produced for the project will be offered to eligible backers as a digital pack for personal use. Misunderstandings – A mini adventure to whet your appetite for the unique qualities of the setting. This adventure is a Kickstarter EXCLUSIVE, and will not be reporoduced anywhere else. We know that everyone is different, and will desire different rewards. PDF or physical copy, pathfinder or 5th edition rulesets, or both. We have arranged the rewards in a number of Backer Tiers that allow you to choose the rewards you want. We also have a special early adopter reward tier for the digital products. IT Project Manager by day, owner of P.B. Publishing by night, known mostly for many bestselling and successful titles on the DMs Guild, including the highly rated horror adventure – The Haunt, the 200 page hardcover tome Adventure Anthology, and a co-creator for the best-selling Monsters of the Guild. Owner of Pyromaniac Press, Micah is a successful Pathfinder and D&D 5e designer, known widely for his adventure path ‘What Lies Beyond Reason’, and the epic D&D 5e hardcover deity supplement; Faiths of the Forgotten Realms. Having run successful Kickstarters previously, Micah comes on board as our Pathfinder and Kickstarter expert. In my youth, Richard A. Knaak’s Dragonlance novels, The Legend of Huma and Kaz the Minotaur, were huge influences on me and, after Weis and Hickman’s Dragonlance trilogies, solidified my love of Krynn. If you’d like to read more about how influential those novels were, you can read fellow Tessera Guilder, John McGuire, give his thoughts on them here. Add to them the Dragonrealm series, and I have been a lifelong Knaak fan. His new series, Rex Draconis, introduces a world that is a love letter to Dragonlance. It’s less Weis/Hickman’s version and closer to the focus of Knaak’s corner of the world, yet manages to be greater than its inspiration. Knaak’s strengths and knowledge of Ansalon let him touch all of the right moments from that world without the work ever descending into being a pale shadow of the better known property like Go-Bots to the Transformers. Rex Draconis remains its own world and story. While the focus of the series are the minotaurs and the not-Knights of Solamnia, they are handled in an earnest manner. There’s more to compare between the series. The kender (the group of annoying Hobbits that would have been wiped out just to end their unrepentant kleptomania) are replaced with the kwillum, a race that look like 10-year-old children who are also porcupine quicklings that are hunting something (in every pouch and coin purse that they pass). They are fast and have quills making them difficult to kill and, while they steal, they don’t do it aimlessly (they’re looking for something). The dragons are not flying mounts for the characters to ride into battle; instead, they’re D&D master monsters. The dragons, starkly good and evil in D&D, are neither in regards to humans in Rex Draconis, they see all bipeds as pawns in their wars so it changes the traditional pulp relationship between the powers that be. This series analog of the black moon of Dragonlance was shattered 400 years ago, which makes it visible as pieces that, I’m guessing, are leaning into the atmosphere a bit much. Every piece has a touch of the old with a nice twist that makes it new. Continuing its homage of Dragonlance, Knaak wants to build the world into a D&D setting and, to do that, he’s working with Phil Beckwith and Micah Watt to make it happen. I’ve backed this and recommend checking out the setting as well as the first novella in the Rex Draconis series. Ends on Thu, October 25 2018 7:00 PM EDT. “Explore Mega-City One and beyond with the official tabletop roleplaying game for the galaxy’s greatest comic! Judge. Jury. Executioner. Play as a Judge of Mega-City One and bust perps, Sov spies, and mutant raiders in this action-packed standalone tabletop roleplaying game, bringing to life the iconic characters and worlds found in the legendary British comic 2000 AD. This book is your introduction to Mega-City One, and your gateway to a line of supplements based on 2000 AD’s many characters and settings. These books are brought to you by Darren Pearce (Doctor Who; Lone Wolf), Robert Schwalb (Dungeons & Dragons; Warhammer Fantasy Roleplay), Andrew Peregrine (Doctor Who; Firefly; Buffy The Vampire Slayer), Russ Morrissey (What’s OLD is NEW), and Nick Robinson. Full colour 270-page hardcover Judge Dredd & The Worlds of 2000 AD core rulebook! The Robot Wars, 100-pages, the first in a series of softcover sourcebooks and adventures! Sturdy two-sided cardboard 4-panel GM screen full of handy reference charts and tables! Beautiful cardstock tokens to represent your characters and their foes! Also, we are offering a limited edition version of the core rulebook with a special cover exclusive to this Kickstarter! Nearly 100 full-colour cardstock tokens to represent your characters and their foes! We are producing a full-colour hardcover core rulebook for the all-new Judge Dredd & The Worlds of 2000 AD tabletop roleplaying game. This book contains all the rules and setting information you need to play any character in Mega-City One, and is the core rulebook for the entire line of 2000 AD settings and worlds. Play a Judge, Civilian, or Perp! Choose from Humans, Clones, Robots, Mutants, Chimps, Gorillas, and Orangutans! Wield the iconic Lawgiver sidearm and ride the mighty Lawmaster motorcycle! Read about Mega-City One, as well as other worlds of 2000 AD! Core rulebook contains everything you need to play in Mega-City One, and provides the core rules upon which the many worlds of 2000 AD are based! Judge Dredd & The Worlds of 2000 AD is a standalone roleplaying game. You do not need any other books in order to play. This 250+ page book introduces you to Mega-City One, and allows you to play Judges, Perps, or Civilians in that futuristic metropolis. This is also the core rulebook for future setting books which will detail many of your favourite 2000 ADproperties, such as Rogue Trooper, Sláine, Strontium Dog, ABC Warriors, and many more! Check out these previews of the game! 2000 AD is a multi-award winning weekly British cult-sci-fi comic anthology that has been running since 1977. Having featured dozens of writers and artists over the years, including Pat Mills, Alan Grant, Grant Morrison, Mark Millar, John Wagner and Alan Moore, 2000 ADbrings you an explosive cocktail of sci-fi and fantasy, infused with a mean streak of irony and wry black humour. 2000 AD is future lawmen in vast megacities. It is post apocalyptic wastelands filled with mutants. It is celtic barbarians and druids fighting evil drunelords. It is robot warriors taming a lawless Mars. It is ancient accords between the British Crown and Hell. It is intergalactic cargo trucks adventuring through space. It is extra-dimensional agencies who repair anomalies across the alternate realities. It is Houdini, Lovecraft, and Doyle as paranormal investigators in the 1920s. It is alien freedom fighters seeking to end the tyranny of humans on a far future Earth. It is genetically engineered soldiers bred for war. And it is much, much more. The worlds of 2000 AD are diverse indeed. And you can play in them all! d6 dice pools. Judge Dredd & The Worlds of 2000 AD uses d6 dice pools to resolve actions. You form a dice pool by adding dice from an attribute, a skill, and equipment. For example, a burglar trying to pick a lock might have 3d6 from her AGILITY attribute, 2d6 from her thievery skill, and 1d6 from her high quality thieves tools, meaning she gets to roll 6d6. The dice are added together and compared to a target number. Detailed rules for simple tasks, extended tasks, and competitive tasks using the same core mechanic allow for a flexible variety of challenges. Disclaimer: I freelance for ENWorld, which is published by EN Publishing who are behind Judge Dredd & The Worlds of 2000 AD. Judge Dredd, while known in the US, has never taken root as it did in its native country, the UK. The best illustration of the difference in markets is the 2012 movie, Dredd. For that movie, the US and Canada (population north of 350,000,000) spent $13,414,714 on the entire run of that film while the UK (64,000,000) spent $6,929,744 on seeing the film. [Numbers from BoxOfficeMojo here.] A population that is less than a 5th the size of the US/Canada bought about half as many tickets as the larger group. That speaks to how much larger the fanbase is in the UK than North America. 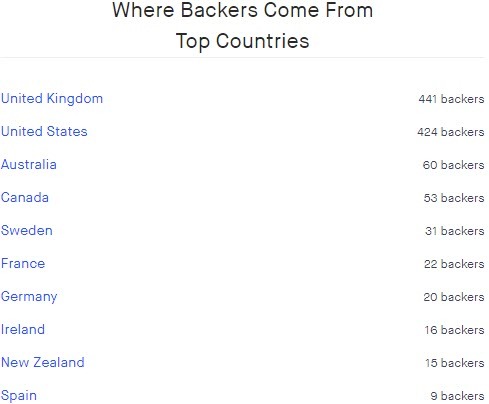 Add to that, in this Kickstarter, as of this writing, the number of American and Canadian backers combined (477) just edges out the UK (441). Should you back this Kickstarter? Does national origin make any difference? I’d say you should, because what makes the difference in audience participation is, in my opinion, The Law tends to display a certain amount of English wit that does not always connect in the US. Yet, in my experience, that wit lives at the gaming table. Judge Dredd has the range to feel pulpy, humorous, and dark all in a single story. Using the WOIN system combined with the player’s natural tendency to take all situations to the extreme, this will be an excellent RPG and I can’t wait to test it out. While this is a hype piece (call a spade), I’m compelled to note that the world of art is poorer today for the passing of Carlos Ezquerra, the character designer of Judge Dredd. His artwork will be missed, and my thoughts are with his family at this difficult time. UPDATE: A free quickstart of the game is available here.